An American astronaut and a Russian cosmonaut will spend a full year aboard the International Space Station in 2015-16, twice as long as current crews, to collect medical data on long-duration spaceflight that will help pave the way for eventual flights to deep space destinations, NASA said Friday. Assigning two lab crew members to a yearlong flight also is expected to free up seats aboard Russian Soyuz ferry craft for two additional space tourists or representatives of other nations that might not otherwise fit into the normal space station crew rotation. In their latest contract with NASA, the Russians charge more than $60 million a seat for Soyuz flights to and from the space station. While a space tourist presumably would pay less, the money would give the cash-strapped Russian program a welcome boost. The Russians launched eight "spaceflight participants" to the station between 2001 and 2008, including one who flew twice. They paid between $20 million and $50 million per flight. It is not yet known who will be assigned to the yearlong station flight, when they will be announced or who might fill the additional Soyuz seats. But Space Adventures, a company that has brokered past tourist visits to the space station, has scheduled a news conference Oct. 10 in Moscow with singer Sarah Brightman. However that plays out, the astronaut and cosmonaut who will stay up for a year likely will launch in March 2015 aboard the Soyuz TMA-16M spacecraft, sources said, accompanied by a Russian spacecraft commander who would stay aboard the lab for a normal six-month tour. Under that scenario, the next Soyuz in the rotation, TMA-17M, would launch with a normal three-person station crew the following May. The Soyuz after that, TMA-18M, would take off that Fall with a Russian commander and two paying customers, sources said, either tourists, researchers representing nations not normally in the rotation or a combination of the two. The spaceflight participants would spend about two weeks aboard the lab complex and return to Earth aboard the Soyuz TMA-16M spacecraft with the same commander that ferried the long-duration crew to orbit the previous March. The long-duration crew members would return to Earth in March 2016 aboard the Soyuz TMA-18M spacecraft with the commander who ferried the commercial fliers to orbit. Other scenarios are possible. The NASA statement provided no details on how the crew rotation might play out and there was no immediate word from the Russians. However it goes, senior NASA managers believe the flight is crucial for plans to eventually send astronauts on missions to deep space targets ranging from nearby asteroids to Mars. "In order for us to eventually move beyond low Earth orbit, we need to better understand how humans adapt to long-term spaceflight," Mike Suffredini, the space station program manager at the Johnson Space Center in Houston, said in a statement late Friday. "The space station serves as a vital scientific resource for teaching us those lessons, and this yearlong expedition aboard the complex will help us move closer to those journeys." While the yet-to-be-named long-duration crew members will set a new record for space station crew, it will fall well short of the world record held by cosmonaut Valery Polyakov, who spent 438 days aboard the Russian Mir space station in 1994 and 1995. 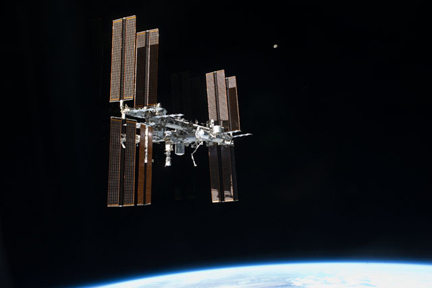 The U.S. record for the longest single spaceflight is held by astronaut Michael Lopez-Alegria, who spent 215 days in space aboard the International Space Station in 2006-07. "We have gained new knowledge about the effects of spaceflight on the human body from the scientific research conducted on the space station, and it is the perfect time to test a one-year expedition aboard the orbital laboratory," Julie Robinson, space station program scientist, said in the NASA statement. "What we will gain from this expedition will influence the way we structure our human research plans in the future." But not everyone is in favor of such missions. Gennady Padalka, one of the most experienced cosmonauts in the world with 711 days in space over flight flights, just returned from the International Space Station. During a post-flight news conference Padalka was asked how he felt about a yearlong stay aboard the lab complex. "Today I'm in the negative," he said in translated remarks, "because to do so, you first need to create comfortable living conditions for the crew, especially in the Russian segment." Veteran cosmonaut Sergei Krikalev, now a senior Russian space manager, said he favored longer stays to "give us new data in science." "With the advent of sophisticated scientific equipment, we can assess what happens to a person who is in space, and what medications to help combat the negative factors of the flight," he said. "This is very important in planning for future long-duration missions." But he agreed with Padalka that living conditions in the Russian segment of the station should be improved. Current space station commander Sunita Williams said in a recent interview with CBS News that she would happily stay a year in space if offered the chance. "I love every minute that I have up here and I think that's the attitude people have to come into it with, that you only have a limited amount of time in space and although a year seems long, it's just one year," she said. "I think people could definitely do it." Longer missions will "give us a little bit more knowledge about what happens to people and if it's feasible for people to go farther and farther, take the trip to Mars and back," she said. "I think living in space for a year is feasible and the ISS is a great place to do it. There are always things to do up here, so I don't think people would get bored. I can't imagine getting bored up here." Asked if she would go if asked, Williams said "absolutely. It's a small amount of your life and if there are science benefits that could come out of that, for sure." "I think it would be great, I think it would be a lot of fun," she told CBS Radio. "You'd probably see a bunch of different crews coming through, too, and that's always interesting to get a new perspective, new people coming up and see how they're adapting. So that would make it a little exciting as well." Joseph Acaba was a member of Padalka's crew, returning to Earth Sept. 16. He agreed with Williams, saying a one-year stay on the space station was more than feasible in the U.S. segment of the lab complex. "It really is very comfortable living up there, the food is good, you have your personal sleep station, you can talk to your family once a week through a video conference, you have a telephone, you have email," he said in another interview with CBS News. "So it's almost like any other expedition we would do here on Earth. "I only did it four months and I would have been happy to stay a little bit longer. I'm sure that with the resources we have up there those astronauts, if they do a yearlong mission, would have no problems with that."